Click on the picture to visit the Gallery. Some of us — hopefully most of us — are trying to understand and appreciate the effect our recent election will have on you, the citizens of the rest of the world. As our so-called leaders redouble their efforts to screw you over, please remember that some of us — hopefully most of us — are truly, truly sorry. And we'll say we're sorry, even on the behalf of the ones who aren't. UPDATE: The Sorry Everybody CD Compilation is available in the iTunes Music Store. (You do need iTunes to access it, I'm afraid.) Check it out; it consists of a bunch of independent artists doing swell protest songs. Thanks to everyone who submitted pictures for the Sorry Everybody book. The book is available in stores and from Hylas Publishing. Orders already placed ship immediately, thank you for your patience. A future book-Apology Accepted-featuring people around the world accepting the apology is in the works. If you live outside the U.S. and would like to submit your photo for this book, head over to our submission page and be sure to check the box giving us permission to publish your image. I'd like to use this sentence to thank Andrew, Andy, Aristotle, Charles, Graham, Jon, Jose, Juliana, Micah, and Mikkel for their invaluable help in running the site. Thanks also to everyone who has offered us assistance, everyone who has sent us kudos or words of encouragement, and especially those of you who have brightened our arduous night with scads of uproarious hate mail. We won't be publishing any of it, but thanks for asking. Keep it up, everybody. If you are a representative of the media and wish to contact us, you may do so at press@sorryeverybody.com. Happy New Year, everybody. Long time no see. First things first. The book's out. There was a slight delay in shipping due to customs, but it has apparently hit store shelves. To those of you who have asked us whether you're in it or not: we wish we could tell you, but we don't know. We didn't take your contact information when you submitted your apologies, and we're not able to use magical Internet techniques to track you down at this point. The Marine from Evanston, Illinois is in there. The baby in the anarchy T-shirt made it in. George from Texas, with the Bea Arthur shirt? Page 88. I'd love it if you all bought a copy to see if you're in it, but I suppose you can also drop by your local megachain bookstore and flip through it to find out. It's a nice, hefty volume, more substantial than I expected. Thank you, Hylas Publishing, for all your efforts. Thanks for your loyalty and your patience, and thanks for your donations and your business. After a pretty necessary respite during this most sorrowful of holiday seasons, we've begun updating the galleries again. Apologizing en masse has been cathartic, hasn't it? It conveys a message that desperately needed sending, and it's this rare thing that Americans need to do more often: an act of participation in our luxurious citizenship. We've done our best to declare that America doesn't equal Bush; now it's time to prove that true. In the past I haven't done everything I could. I haven't donated or protested or volunteered or written or said enough, and neither, I'm sure, have some of you. So let's get on it. In the coming weeks, we'll be opening a new organization dedicated to encouraging civil political discourse in American politics. Imagine a respectful conversation between the two groups of Americans who have been so suspicious of each other for so long. Yeah, just spend a few minutes imagining that...and come back next week. No updates in a while, I know. I wish our careers, academic and otherwise, permitted us to dedicate more time to sorryeverybody.com. We're still approving pictures and placing them in the galleries, albeit at a slightly reduced rate. We're also working on the book and the CD and the benefit concert in New York City! It will be December 17th and 18th; for more info, click the link. We realize that as the galleries have expanded in number, our navigation system has become more and more cumbersome. Today a brand new gallery debuts. You have the choice of browsing thumbnails or single images. Click on a thumbnail to display it as a single-image slideshow. While you're browsing through the images, enjoy the everpresent "Thumbnails" and "Random" buttons, whose meanings shouldn't be tough to figure out. There are sure to be some kinks at first, so let us know what's going wrong at contact@sorryeverybody.com. What else is new? I'd like to remind everybody that we can't accept submissions by e-mail, that we won't publish hatemail, that you should visit apologiesaccepted.com, and that you ought to hold on to your sorry pictures, because by tomorrow we will be asking you to resubmit them under an image release that will permit us to print a Sorry Everybody book! Stay tuned for details. The store has been updated and now features the much-requested bumper stickers as well as a new section of products featuring the drawing from the spiral notebook you see above. Products may have shifted around some (non-apparel has its own section), but everything is still there. Have any other product or design ideas? Let us know! T-shirts are here! Along with sweatshirts, lunchboxes and buttons. Cafepress is an excellent service that provides consumer goods to websites of every stripe and size. Possibly in the future we will find a more high-volume wholesaler. Those decisions are all contingent on the demand for these items, so snap 'em up from the store. Now, who wants a sorryeverybody.com book? Send us an email. We are infinitely grateful to those of you who have donated so far. Thanks for your generosity, support and good faith. We have almost broken even on our bandwidth costs. In case you're wondering if we're profiteering, all our man-hours have been pro bono so far. If this ever takes up enough of our time that we deem it necessary to pay ourselves, we'll do it by other means; as we said before, everything donated that we don't use to pay our hosting providers (the inimitable and superlative Rackspace) will be donated to charity. Speaking of other means, how would everybody feel about Sorryeverybody T-shirts? We understand that we have to tread carefully in the waters of commerce, as this site is about message and not merchandise; still, after careful consideration, we figure a T-shirt is a message and it'll help us pay our skyrocketing expenses. Drop us a line and let us know. 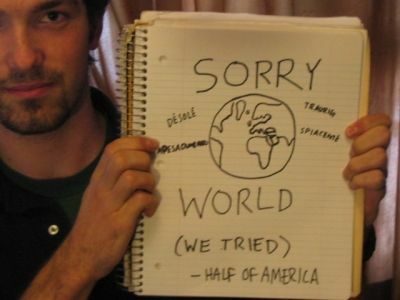 The submission page is ready to accept your apologies to the world once again. Thanks for staying with us! We realize that our submission form has been disabled for quite some time. Being that our site is maintained by a loosely affiliated collective of nerds nationwide, it follows that there will be the occasional organizational breakdown. We'll have the submission page running again before the day is out. To those of you who have submitted your pictures by email since the form has gone down: I'm sorry, our email box is so full at this point and our days so busy that we can't deal with each and every one of your submissions. We respectfully request that you resubmit using the form once it is back up. You can, of course, still throw us a line at contact@sorryeverybody.com. Welcome to the new, deluxe, velour-appointed, vegetarian-friendly limited edition of sorryeverybody.com. It's certainly been an adventure so far. What does the future hold in store for us? Only you, dear reader, can tell.